Am I a little late with this fall inspired pizza? Maybe. Am I the only one that feels like everyone else is more organized than me? It seems that way. All my favourite food bloggers are already talking about all the cute, amazing, DIY holiday gifts that they’re making, and here I am with my apple butter. That’s ok. I’m saving my eggnog and holiday thoughts for December. I’m still pining after my birthday and the warm weather in San Diego. And I’m eating pizza. We should talk about apple butter instead of tomato sauce as a pizza base. This is genius! I’m all about creative substitute for tomato sauce. I love my pesto, and last fall I used pumpkin puree mixed with cream cheese. This year, it’s apple butter. Believe. 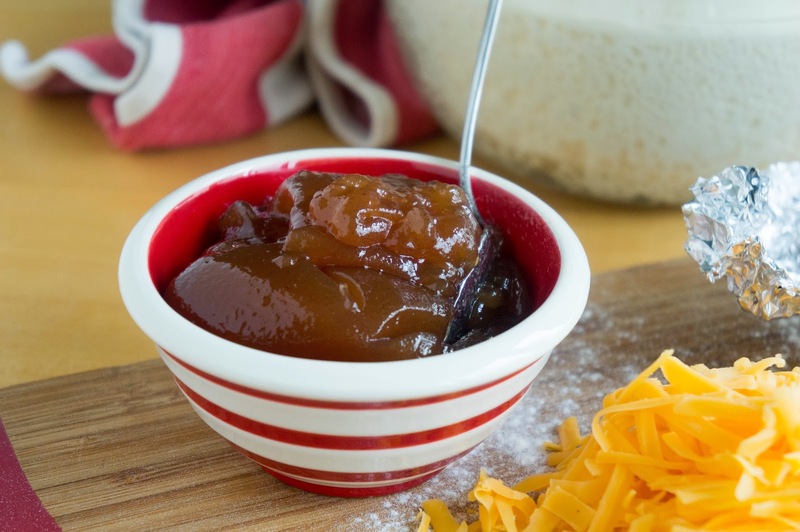 The sweet and spicy apple butter is a perfect match for cheddar cheese. Just like the diner staple apple pie with cheddar cheese. And who doesn’t love roasted garlic and bacon? I also firmly believe that if you have time to make pizza, you have time to make your own pizza dough. This is my favourite recipe and is super easy and ready in 1.25 hours. So let’s pretend that I posted this about a month ago and eat some pizza! 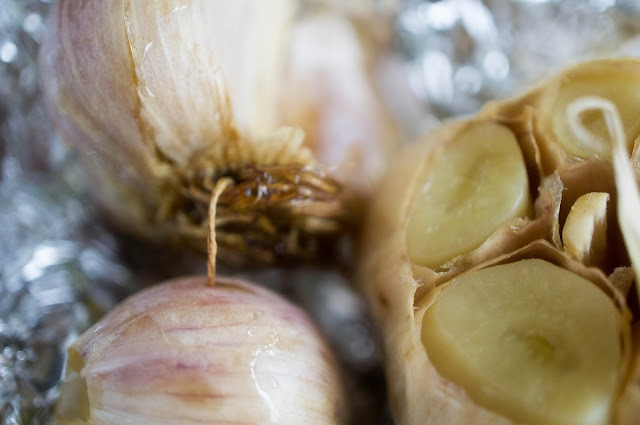 To roast garlic, peel away the outer skin as much as possible. Cut the tops of the heads off so the cloves are exposed. Place each one in a square of aluminum foil. Sprinkle with salt and pepper and a little oil and wrap up. Roast in an oven preheated to 400F for about 30 minutes or until the cloves feel soft when pressed. Let cool slightly. When cool enough to handle, squeeze the cloves out into a bowl and mash up with a fork. Cut bacon into small strips (lardons) and fry over medium heat until crispy. Drain on some paper towels. Increase oven temperature to 500F. If your smoke alarm is like mine, turn on all fans and open the balcony door. Stretch pizza dough onto a lightly oiled pan or pizza stone. I use a large rectangular sheet pan. It doesn’t need to be perfect. We’re free-forming. Get the crust as thin as you like/can. Spread with apple butter, as much as you like! 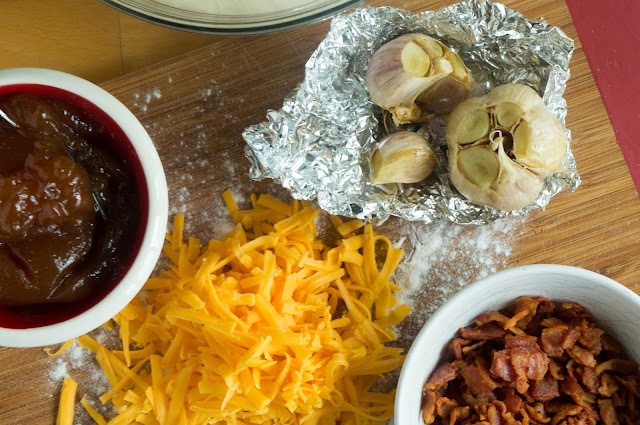 Distribute mashed roasted garlic and crispy bacon over the pizza. Bake at 500F for 10-13 minutes or until crust is golden brown on the bottom. 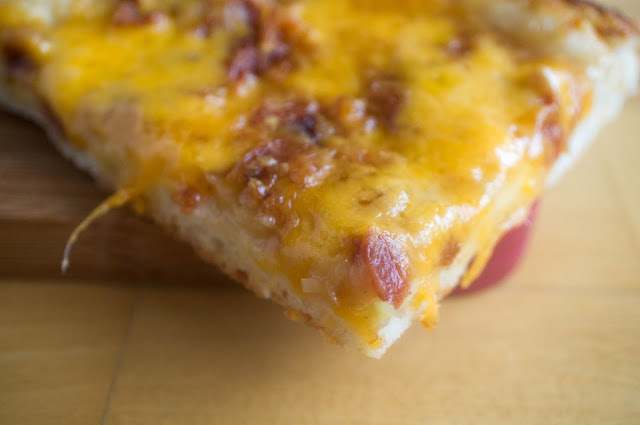 Sprinkle pizza with grated cheddar and put back in oven just until cheese is melted and bubbly. 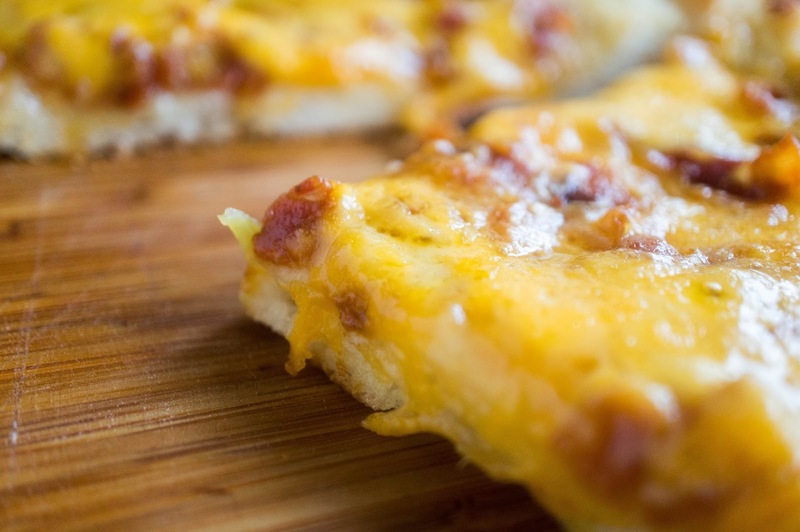 Remove pizza from oven and let cool slightly before cutting into slices and eating. Stir yeast into warm water and set aside. In the meantime, whisk together flour and salt. Make a well in the center of the flour and pour in water/yeast mixture, honey, and oil. Stir flour into wet ingredients until a shaggy dough forms. 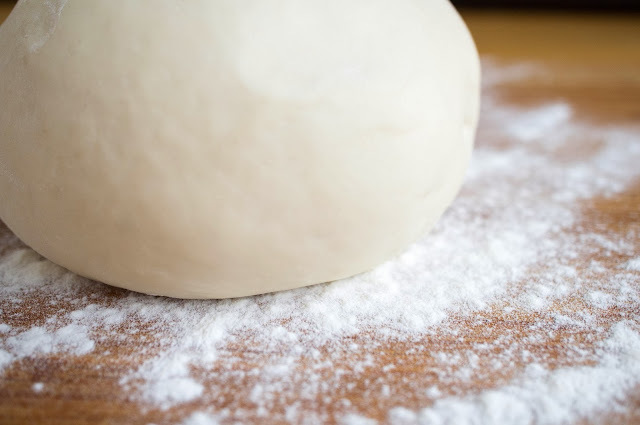 Dump dough out onto a lightly floured surface and knead for 4-5 minutes or until dough is smooth and elastic and isn’t sticky to the touch. It's like a workout so we can eat more pizza! Lightly oil the dough ball and put in a large bowl. Cover with a clean towel and put in a warm place until double in size, about 1 hour (roast garlic while you wait!). 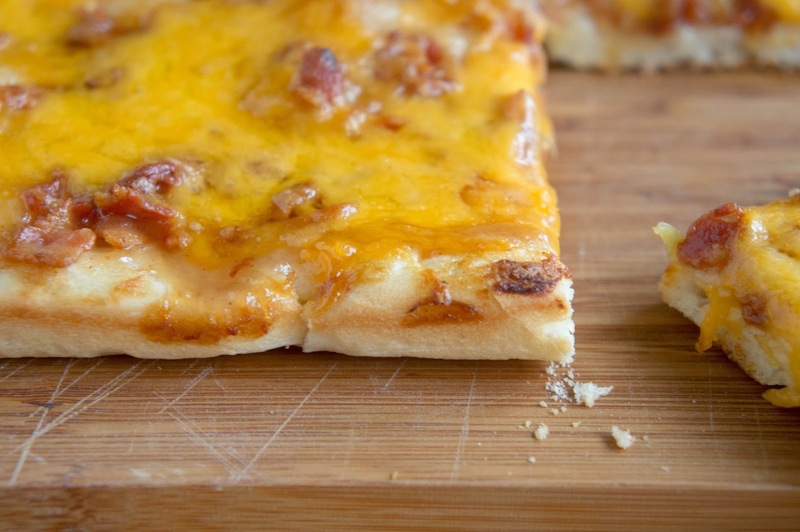 Proceed with pizza recipe of your choice! Do you get the feeling that I'm going through your entire blog?